When it comes to nutrition, most plants (including turf grass) require more nitrogen than any other element to maintain a healthy growth rate and vibrant appearance. Unfortunately, nature is quite effective at hindering both natural and synthetic nitrogen-based fertilizers from reaching their intended targets. Over the last half century nitrogen loss to the environment has forced agronomists and engineers to develop innovative fertilizer technologies that combat this problem. There are many types of nitrogen fertilizers, including but not limited to straight urea (immediately available N), as well as coated urea and reacted urea (otherwise known as slow or controlled release N). Coated urea uses a physical barrier (usually sulfur, polymer, wax, or any combination thereof) to slow the release of urea into the soil over time. Reacted urea (such as methylene urea) uses chemistry and microbial activity to control the availability of urea in the soil over time. 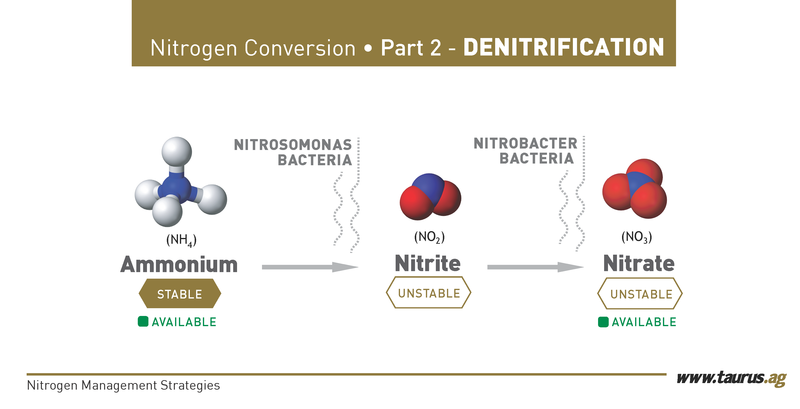 In this feature, we’ll examine another nitrogen technology called “stabilized nitrogen.” As we’ll discover, stabilized nitrogen can also be tied to microbial activity, however the mode-of-action is quite different from that of reacted urea. Before we can explain how stabilized nitrogen works, we must first look at the nitrogen cycle and understand how nitrogen is deposited and converted in the environment. The nitrogen that plants use comes from many sources. Interestingly, earth’s atmosphere is composed of 78% nitrogen. Over time, many plants developed symbiotic relationships with nitrogen fixing bacteria such that these bacteria capture nitrogen from the air and convert it into a form that can be absorbed by plant roots. Other sources of nitrogen include decaying plant matter, animal manures, and biosolids. Today, the most common source of nitrogen used for crops and turf grass is synthetic fertilizer, primarily urea and ammonium sulfate. Regardless of the source, once in the ground nitrogen is constantly being converted from one form to another via numerous biological and chemical modes-of-action. Plants can only use nitrogen in two forms, ammonium (NH4+) and nitrate (NO3-). Unfortunately, nature is constantly fighting to convert nitrogen into something that plants can’t use, hence nitrogen stabilizers disrupt the nitrogen cycle in an all-out battle to keep nitrogen in the forms of ammonium and nitrate for as long as possible. When straight urea is distributed onto the ground, it is quickly converted into ammonium, however if this process occurs above ground, urea is quickly converted into ammonia gas (NH3) due to the interference of key soil bacteria. This process is called volatilization. Once this occurs, the nitrogen is permanently lost to the atmosphere. Remember, plants prefer ammonium (NH4+), but nitrogen is often converted out of this form before plants can get to it. Even if this happens, all is not yet lost. The process of ammonium converting into nitrate (NO3-) is called nitrification. This reaction takes place in two steps: ammonium is converted into nitrite (NO2-), and then nitrite is converted into nitrate (NO3-). These two conversion steps take place thanks to the intervention of two key soil bacteria, Nitrosomonas and Nitrobacter. This is important because nitrogen stabilizers have an impact on these bacterias’ ability to convert ammonium into nitrate (we’ll come back to this shortly). The good news is, even if nitrification takes place, plants can still use nitrate as a nutrient source. The bad news is, nitrates are very susceptible to leaching. Leaching occurs when nitrate dissolves in water and is carried out of the root zone, making it no longer accessible to plants. Nitrates are also susceptible to denitrification. This is a process by which nitrate is converted into a nitrogenous gas and becomes lost to the atmosphere via volatilization (N2 or NO2 gas). While the nitrogen cycle is a bit complicated, the key message is that nitrogen-based fertilizers are constantly under attack by the environment. Nitrogen stabilizers work to hinder the environment from robbing valuable nitrogen away from plants. What is DCD and how does it work? What is NBPT and how does it work? NBPT, formally referred to as n-(n -butyl) thiophosphoric triamide, is also a type of nitrogen stabilizer, however NBPT is a urease inhibitor. Urease is an enzyme found many soil bacteria, fungi, algae, and in some higher organisms. Urease catalyzes the hydrolysis (or breakdown using water) of urea into carbon dioxide and ammonia gas. Under the right conditions (usually excess moisture and heat), it is not uncommon for bacteria on or near the soil surface to convert up to 95% of urea fertilizer into useless ammonia gas when soils are water logged and the temperature is 75 degrees F or higher. This represents a major problem for farmers and lawn care operators. Urease inhibitors (such as NBPT) block the active site of the urease enzyme so that the conversion of urea into ammonia gas is inhibited (see diagram 1 and diagram 2 to the right). This means that most of the urea remains untouched so that it can be converted into ammonium, which plants can use. In summary, NBPT significantly decreases nitrogen volatilization. Should I Use Nitrogen Stabilizers? Does the soil my turf grows in consist primarily of sand and clay, or is it loaded with organic material? If your soil is high in organics, you likely have higher populations of microbials and may want to consider the use of nitrogen stabilizers. Is my climate relatively hot or cool? Do I live in an area with little, moderate, or significant rainfall? Is my turf subject to frequent water-logging? Nitrogen stabilizers become more valuable in warmer, wetter climates. When these elements combine, nitrogen stabilizers become extremely valuable. For example, if you live in the southeast United States and your turf is subject to high temperatures, frequent rainfall, and water-logging, strongly consider the use of nitrogen stabilizers. It is important to remember that even northern states such as Minnesota and North Dakota are subject to heat-waves and water-logging during the summer months. If fertilizing turf in the northern latitudes under these conditions, the use of nitrogen stabilizers is also strongly recommended. No matter your situation, Turf Care Supply has a variety of nitrogen stabilizers, in addition to slow release nitrogen products to suite your needs. To view these technologies as well as others, visit our Controlled Release Technologies page on our Website or download the Product Catalog for details.